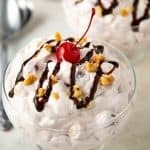 Everything you love about a banana split in an easy, creamy and delicious fluff salad! Stir together condensed milk and whipped topping in a large bowl until combined. Add pie filling, bananas, pineapple and walnuts and stir gently to combine. Cover and refrigerate at least 1 hour before serving. When serving, drizzle with chocolate syrup, sprinkle with additional walnuts (if desired) and top with a maraschino cherry.